Home / baseball / Buffalo / Buffalo Bisons / buffalo wings / CM / Daily Update / MiLB / Sports / superhero night / Bisons unveil 'Super Celery' jerseys for annual Superhero Night - August 11th! Bisons unveil 'Super Celery' jerseys for annual Superhero Night - August 11th! BUFFALO, N.Y. -- Superheroes not only save the day, sometimes they save the best for last! And because of that, it was an easy call for the inspiration for this year's Superhero Night, presented by NCCC. Move over Man of Steel. Step aside, Dark Knight. This year it's SUPER CELERY to the rescue! 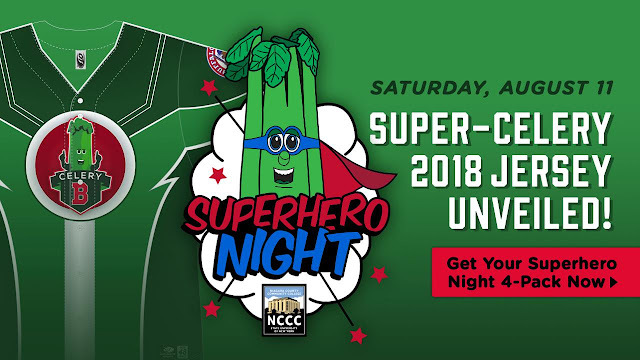 As the Bisons take on the Toledo Mud Hens for their annual Superhero Night on Saturday, August 11 (6:05 p.m.), they'll be donning 'Super-Celery' Jerseys in tribute of the ballpark's beloved vegetable. The two-toned green Super Celery jersey features the 'Just One Win' patch on the chest, celebrating Celery's victory in its final race before retirement last season. The uniforms will be worn by the Bisons players on Superhero Night, autographed, and then auctioned/raffled to benefit the Superhero Alliance of WNY! Superhero Night at the ballpark features all your favorite heroes and villains available to meet and get your pictures taken with. There will be a video storyline played out on the Bisons scoreboard during the game, leading to a fantastic postgame battle on the field. Of course, no Superhero Night is complete without a spectacular fireworks show! Tickets for Superhero Night are on sale now (CLICK HERE). But if you are going to save the day, why not save money, as well!?!? The Bisons are also offering a Superhero 4-Pack that includes tickets and food for the whole family PLUS a superhero cape and shield… All for only $86. That's a savings of over 20%! Plus, you can add additional cape and shields to your pack or purchase your Super-Celery jersey raffle tickets in advance.